14.1% alc., 1,560 cases, $30. Bottled June 2015. 75% of grapes from a well-known vineyard just outside Sta. Rita Hills AVA and remaining 25% for several well-known vineyards in the Sta. Rita Hills AVA. Dijon clones. Harvest Brix 24.8º. 3-day cold soak, aged on the lees for almost 32 months in a combination of 20% new, 40% once used and 40% neutral French oak barrels. Moderately light reddish purple color in the glass. The aromas and flavors of blackberry, olalliberry, spice, smoke and anise are presented in a forward, easy drinking style of that offers good harmony. Bright and clean, with mature, balanced tannins, and a suave finish that leaves a good impression. Additional time in bottle has brought this wine considerable appeal. 14.1% alc., pH 3.43, TA 0.73, 1,200 cases, $40. 95% of fruit from Fiddlestix Vineyard and 5% from La Encantada Vineyard. Harvest Brix 24.6¼. Clones 113, 115, 667, 777 and Pommard. 3-day cold soak, aged on the primary lees for 22 months in 10% new and 60% once-used French oak barrels. Gently filtered. Moderately light cherry red color in the glass. Pleasant aromas of red cherry and raspberry lead to a light to mid weight styled wine that offers delicious cherry and red raspberry fruits accented with spice and cola. Forward, with an aggressive mid palate attack, finishing with vibrancy and clarity. 14.9% alc., pH 3.40, TA 0.68, 318 cases, $75. Clones 113, 114, 667, 777 and Pommard from Fiddlestix Vineyard. Harvest Brix 24.7¼. More than 95% free-run juice. 100% de-stemmed, aged on the lees for almost 30 months in 35% new French oak barrels. Unfined and unfiltered. Moderate reddish purple color in the glass. The nose leads with aromas of black cherry, blueberry and wine cave. A rich core of ripe black cherry and boysenberry that offers a riper profile than the 2012 appellation bottling. Easy to drink, with mild tannins, and a hint of oak, finishing with good intensity and the slightest sense of warmth. 14.9% alc., pH 3.23, TA 0.665, 95 cases, $100. 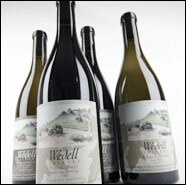 Sourced from one very small section of the Fiddlestix Vineyard that is within sight of the barn. Harvest Brix 24.4¼. 100% de-stemmed, 6-day cold soak. All free-run juice. Aged on the primary lees in 30% new French oak barrels for almost 30 months. Unfined and unfiltered. Moderately dark reddish purple color in the glass. Well-endowed with bright aromas of black raspberry and spice. Luscious and classy, with a charge of dark red and purple fruits that envelope the palate and find every nook and cranny in the mouth. Very suave with refined tannins, juicy acidity, and a peacock finish of uncommon length. A striking, irresistable wine. Golden color; lush, toasty nose; creamy and rich with intense, evolved style and layered flavors; dense and long. Unfiltered and unfined, this Chard shows toasty new oak on creamy texture in a dense rich and ripe style with tangy fruit and juicy acidity.